A boat taking off from Apgar heads across Lake McDonald on Monday morning, Aug. 13, 2018. Three fires burning in the park have reduced visibility and air quality. A wildfire destroyed structures and forced evacuations Monday from the busiest area of Montana’s Glacier National Park, as officials in California prepared to reopen Yosemite National Park after a two-week closure at the height of the summer season. Glacier’s Sprague Creek campground was closed and evacuated, a day after a fast-moving fire triggered the evacuation of dozens of guests from the historic Lake McDonald Lodge last Sunday night. A fire burns Sunday next to Lake McDonald in Glacier National Park in northwest Montana. The fire, which was started by lightning on Saturday night, has forced the evacuation of the Lake McDonald Lodge and a nearby campground. A second campground and private residences inside the park’s boundary also were evacuated and a 30-mile stretch of the scenic Going-to-the-Sun-Road was closed to traffic. The road, with breathtaking views of the park’s mountainous interior, is a major draw for tourists. From left, Yaqmur Abay from Turkey and Anne Ruiz from Spain, two summer employees in Glacier National Park, sit on the edge of the Apgar dock with the feet in the water of Lake McDonald on Monday morning, Aug. 13, 2018. The iconic view into the park has been completely obscured and air quality has been significantly affected by multiple wildfires which are currently burning. More than 400,000 visitors last month passed through the west entrance of Glacier, near McDonald Lake. August is typically just as busy, and a protracted shutdown of part of the park could hurt the tourist-driven local economy. The fire burning in Glacier was one of several started by lightning on Saturday evening. 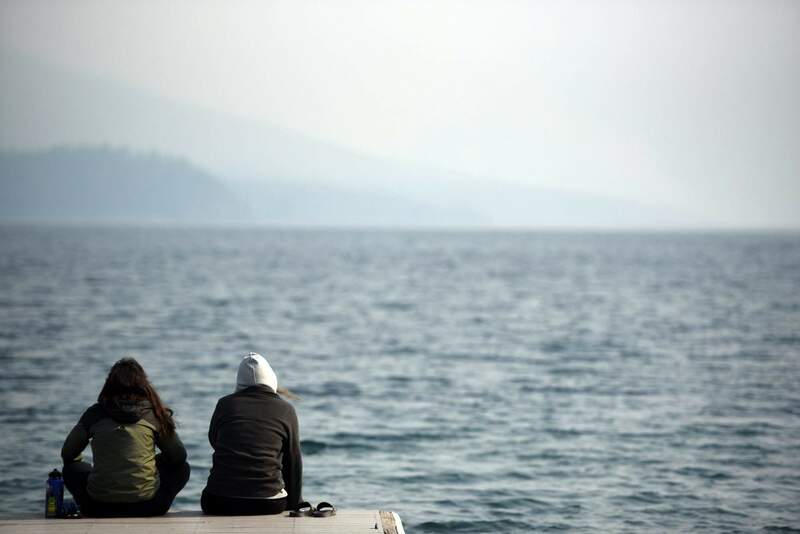 Windy, dry conditions on Sunday caused the blaze to spread rapidly, in full view of tourists and people who live and work around Lake McDonald, a 9-mile- (14-kilometer-) long body of water ringed by steep-sided mountains. 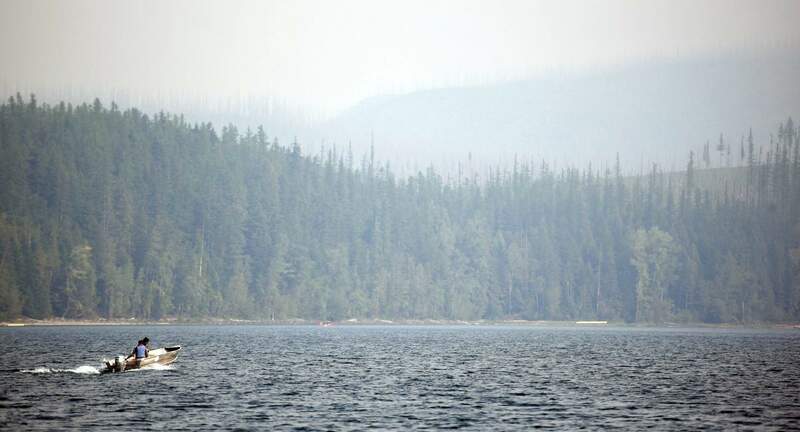 It’s the second year in a row that wildfires prompted evacuations around Lake McDonald. A blaze in the area last year destroyed the Sperry Chalet, an iconic backcountry lodge built in 1914. 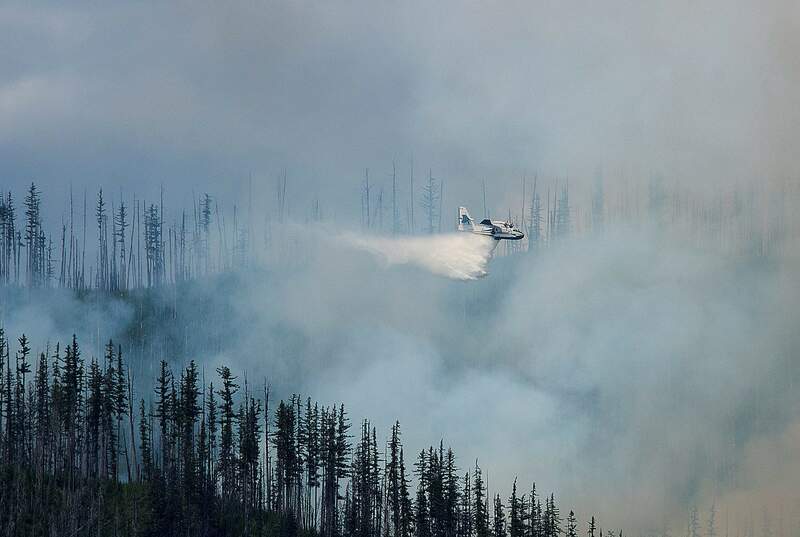 An air tanker drops water Sunday over a wildfire burning in Glacier National Park, Mont. 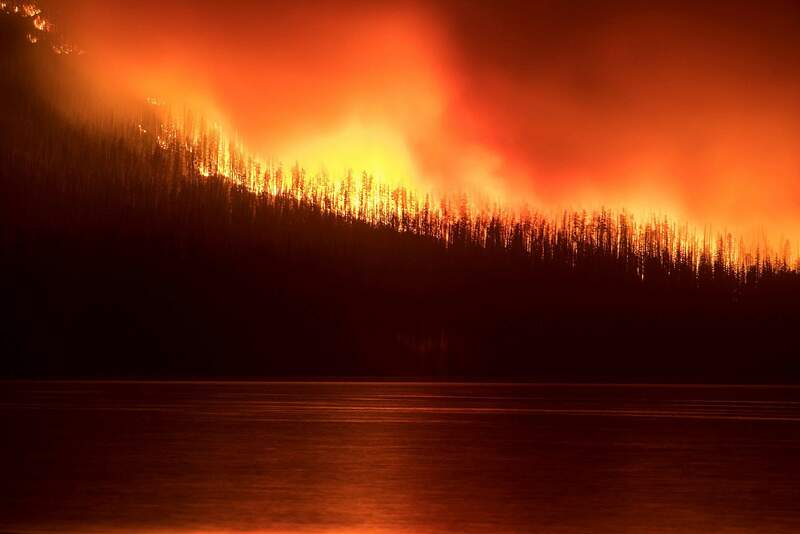 The fire was started by lightning on Saturday night and forced the evacuation of the Lake McDonald Lodge and closed part of the scenic Going-to-the-Sun Road in the park.